So you have a Facebook business page. That’s great, but creating a Facebook page is just the beginning. Sharing engaging content, being consistent and growing your fan base all important pieces of a successful strategy. In order to grow your “likes” you need to share content consistently and make sure the content is fresh and engaging. As we work with various clients from small businesses to corporations we have several strategies we implement to increase their likes and build an engaging fan base. Follow these 6 simple steps to get more Facebook likes. Recommend your page to friends by inviting your friends to like your page. From the admin panel click the drop down Build an Audience and invite friends. Only admins can invite friends. Invite email contacts from your contact databases. You can use your email service contacts and also your Constant Contact or MailChimp contact database. Share your page on your profile. You can share your page by selecting Build Audience from the admin panel. 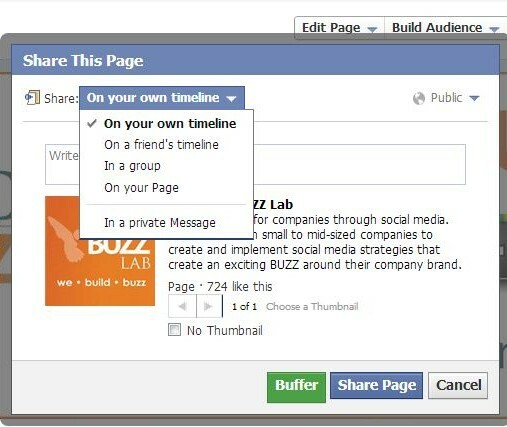 You can share your page on your timeline, in a friends timeline or in a group. Link your page to your personal profile by adding it as your Work. Many people miss this step and it is so important to have it linked on your personal profile timeline. Edit your Work and Education and enter the name of your page. As you start typing a match will pop up and you want to select it. Click done editing to save your change. This will link your work status to your page and your friends can now easily get to your page from your profile. 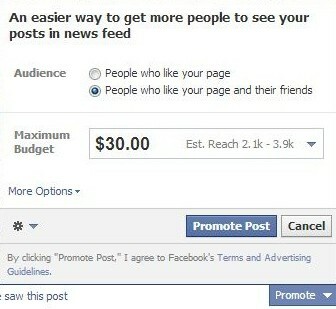 Start a Facebook targeted ad campaign using sponsored ads. Although this takes an investment it truly does make a differencein growing your likes. Sponsored ads are targeted to people who have liked your page AND their friends. We tend to let our friends influence our decisions I recommend choosing an affordable monthly budget (as little as $25 makes a difference) and running this a few months. You should see a steady climb in “Likes” in your insights. Promote selective posts to increase visibility of certain blog posts and events. This is a fairly new feature from Facebook and only works for new (less than 3 days old) posts on your page. It is only available to pages that have 400 likes. After you publish your post you can choose to promote it by selecting the “PROMOTE” drop down on the lower right side and select the amount you want to spend for your estimated reach. Promoting posts does make a difference but don’t over user it. These are some proven strategies that we implement to get our clients more Facebook page likes. Contact us if you would like to learn how we can help your business build BUZZ and grow your fans on Facebook. Hi Patsy, I’d love to see these tips and last time, I created a campaign with a budget of $50 then $5 each day for my budget and it’s growing so great but when my 50 bucks gone, I really feel bad about it. I was thinking it’d be great to set my budget to only like $2 each day and now my page insights is dropping so badly just because I couldn’t keep up with insights. However, there is a good thing, my facebook page fans grow very naturally after using advertised my page. Thank you Ferb! You can use a very minimal budget and get steady results. I suggest running different targets and criteria with your ads to see what is working the best. I generally run 3 different ads under the same campaign to see what my audience is responding to best. I wish you the best in your campaigns and we will keep posting tips and strategies to help you!! Thanks again!! Hi Pasty, thanks for these tips. I’ve been doing a lot of promoted posts and the results have been very impressive. I’ve had more enquires and more customers since I started doing them. I recently noticed that you can do promoted posts on your personal profile and that has been another winner for me. Hey Ruth! Thank you for sharing your thoughts!! I think the promoted posts work well also. I’m so glad to hear you have gained new customers since using the promoted posts. I’ve not personally used them for my personal profile but it’s good to hear they are working for you. Thanks again for sharing your success!! I was wondering if sponsored stories work on old activities (I am unsure of you have tried this exact feature) ? For example, if I launch a sponsored story campaign for friend likes will it focus only on the likes from the start of the campaign ? I am looking to boost a community that is no longer getting likes and has under 400 fans. Hi Melissa, I’m not sure I understand your question but, a sponsored story is going to display your ad to Friends of Friends who have already liked your page, regardless of when they liked it. If you have defined any additional targeted options it will direct your ad accordingly. Depending on your campaign budget is how quickly it will grow your likes. I suggest you watch your insights and if you need to tweak the ad do so making one change at a time so you can monitor to see if it is working. It’s best to try multiple ads with different options at a time to see which works best. Good luck Melissa!! Check my page out and give it a “Like” and I’ll return the favor! Hi There, I was little skeptical about running a facebook ad but now i think it’s worth giving it a try…Thanks for sharing these information. You’re welcome! I think you will see results with the ads. Just always monitor them to see if you need to tweak them a little!! Facebook is now a great marketing tool. Thanks for your valuable knowledge in creating a buzz about our facebook page. Kiss Kiss ! Hi i m from kaididstore & kaidid10. i have liked your page, hope you will liked me back. thanks. 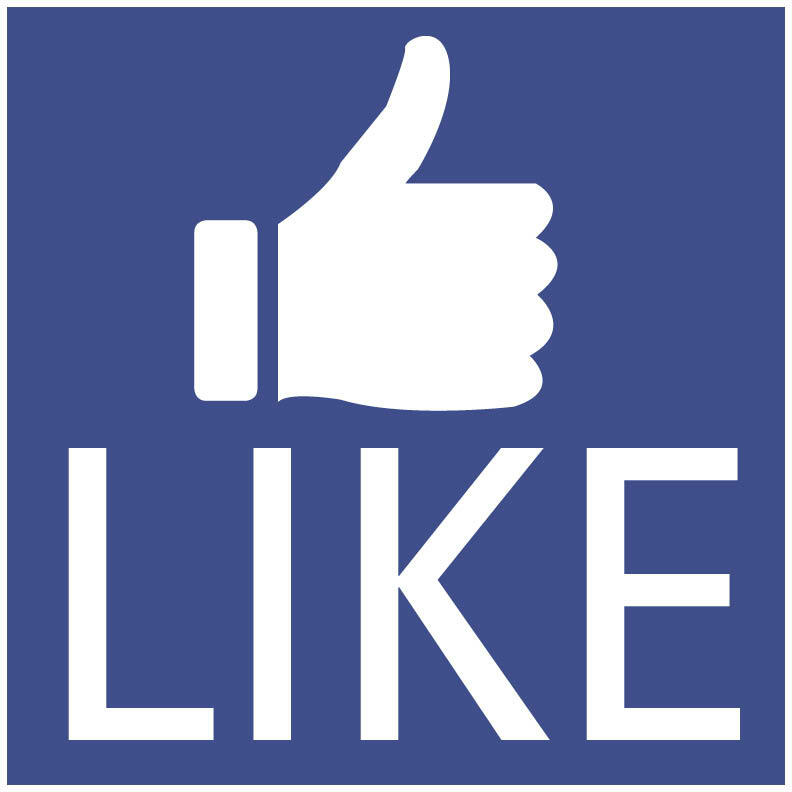 For any business the most important is to have more likes on a facebook page. When we see on same page more than 1000 likes we can visit that page. So I think in the beginning maybe is better to use some exchange service like http://www.socialgainup.com that I think is one of the best because you don’t lose your likes in time like with some other similar sites. I already had a facebook page before setting up my blog. How do I link the two together so I can invite friends to like my blog on Facebook? I haven’t a clue how this works! Can I add a facebook link to my blog and if so, how? It’s awesome in support of me to have a website, which is helpful in support of my knowledge.